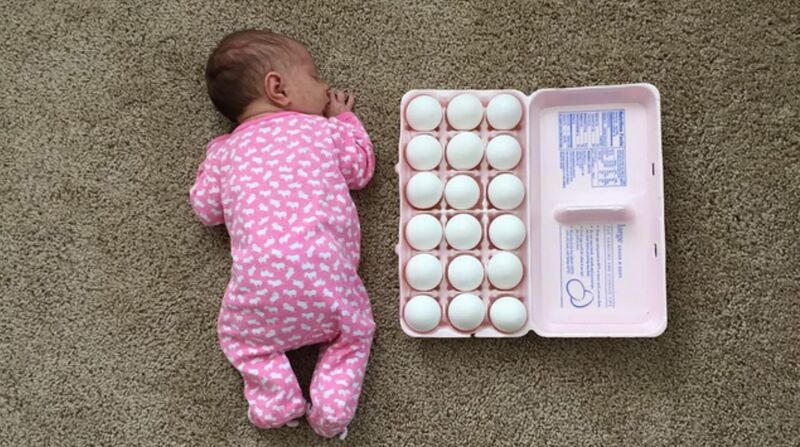 First, there was a mom who went Instagram famous after posting pictures of her sleeping baby next to her puppy, and now a mom named Jennifer G. is posting snapshots of her tiny 1-month-old baby (who weighed just over 5 pounds at birth) next to random household objects. Our ovaries just exploded. Jennifer — the mom behind herewegoajen on Instagram — gave birth to her third baby, Alexandra, a bit early at 37 weeks after doctors discovered she had a circumvallate placenta. She was also monitored heavily throughout her pregnancy due to a blood clotting disorder and a history of intrauterine fetal demise. Alexandra was born healthy but only weighed 5 pounds, 7 ounces, and measured 18-3/4 inches long. Jennifer did what we all do after having a baby — take hundreds of photos. She snapped a photo of Alexandra next to a bunk bed so she could document her tiny size and couldn’t get over the visual. In case you forgot how tiny newborn babies are, these photos perfectly capture that brief and adorable moment in time. Somehow, we don’t think posting pictures of a gangly tween next to tiny objects would have the same effect. Here are some of our favorites. Be prepared to melt. Jennifer said big brother Ryan had to be bribed with M&Ms to let her take this photo with his favorite toys. Alexandra looks tiny (and a little shocked!) at her sister’s giant princess gown. “Being tiny is so exhausting,” joked one follower. Baby versus Cheerios? Stop with the cuteness. I can’t even. Tiny baby versus a dollar… and the dollar almost wins. We will never look at a bag of Doritos the same. Baby Alexandra is the size of a backpack. It looks like she can’t wait to try her first bite of Nutella. We hope she’s hungry, because the bottle looks huge!